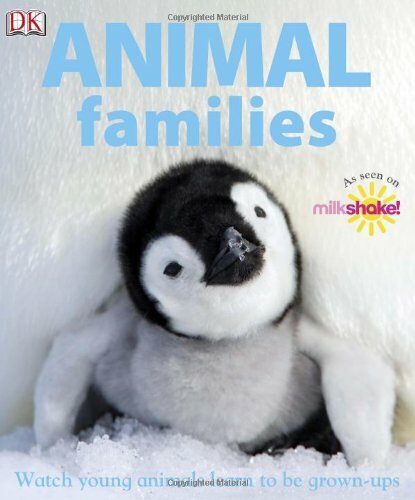 Natural history is here served up cute and cuddly in this pictorial guide to animals growing up. Tied in with Channel Five’s series Milkshake, the photos are as sweet and frothy as the series name. The reader is encouraged to compare animal behaviour with our own, at feeding time, at bath time and at playtime, but sometimes the text seems to get carried away with the idea: ‘When human children sit on grown-ups’ shoulders, we say they’re having a piggy back, but pigs don’t do this!’ Speech bubbles put the text into the first person with a rabbit announcing ‘After bouncing around I like to go to sleep in my cosy underground tunnels called a warren.’ A simpler layout might have better suited the young audience, but enjoy the photos and make up your own text.